Note to marketers: you probably don't want to carry the poolroom metaphors too far when you're applying them to an automobile. 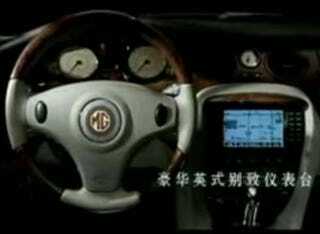 In this ad for the '07 Nanjing MG 7, we learn that the Chinese-built Rover 75 descendant has taillights that resemble racked balls, a steering wheel that resembles a cue ball, and it grips the road the way ivory grips felt. Does Nanjing Automotive do a good job of carrying on the ol' Morris Garage traditions? Insert Lucas Electrics jokes here!